No, wait, that the postman. 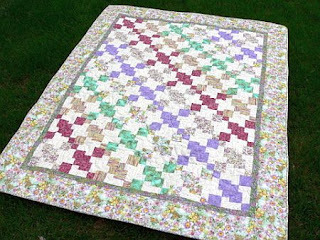 But it also applies to this intrepid band of quilters -- we had rain, snow and WIND this May! 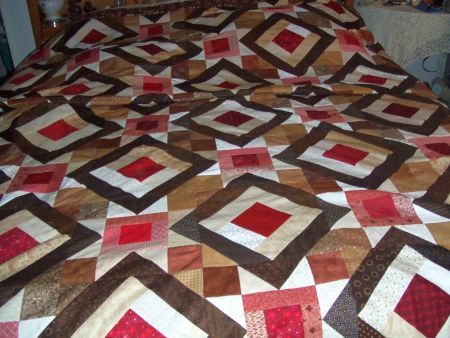 And look at the finishes 52 Quilts "13 in 2013 Challenge" participants submitted! Oh. Wait. First, you want to know what quilt to work on in June. June's challenge is UFO #9. If you're a new reader, you can play along with the "13 in 2013" challenge. Just go here to read how! 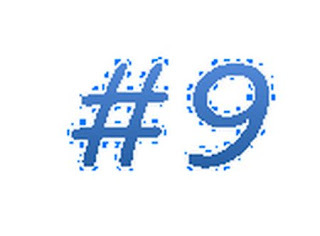 My #9 UFO is another old old oldie! The instructions for this project (prints cut out, no background cut and not a single stitch sewn!) are from a magazine dated 2002! I found an entire bolt of white Michael Miller "cotton couture" to use for the background. Or maybe I'll use Kona Cotton "snow." 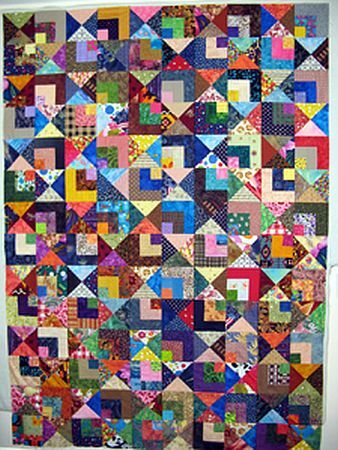 Either way, I'd better get started, because there is a new Scrap Squad quilt due later this month! Hmm, I see I didn't post a photo of my May UFO project underway. 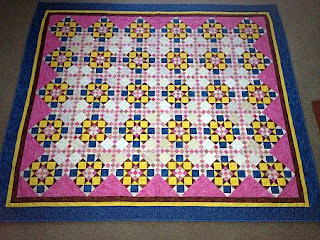 The top is pieced, that's finished for me! 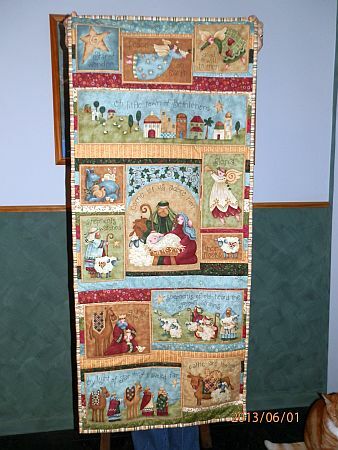 I worked on this quilt at Quilting in the Pines in McCall, Idaho. I had the blocks up on my nifty new portable design wall, and every time someone complimented it, I said "Oh, but I don't like this style of fabric." Guess what? By the time I had it finished, I'd fallen in love with it! This is a Deb Caffrey mystery I made a couple of years ago in batiks. 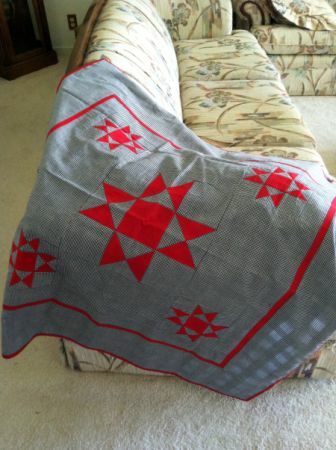 A fellow quilter made hers in Civil War Reproduction fabrics, and I liked it so much, I made the quilt again. 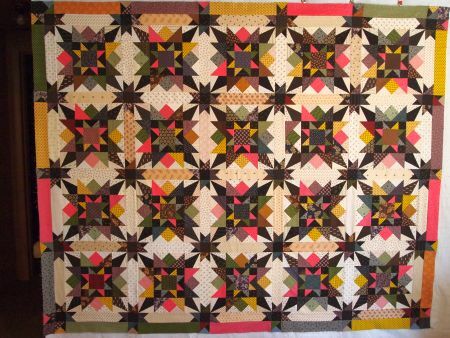 I love how the bubblegum pink "pops" in this quilt. It is called Box of Chocolates and I got the pattern from American Patchwork & Quilting, December 2010 Issue 107. 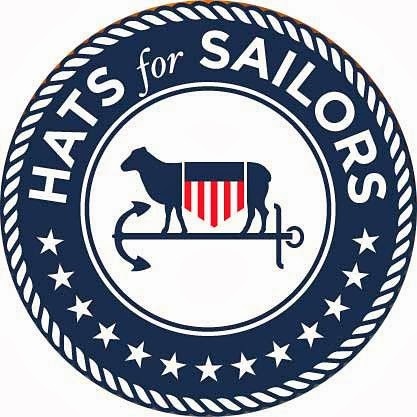 The pattern was made by Chloe Anderson and Colleen Reale of Toadusew Creative Concepts. 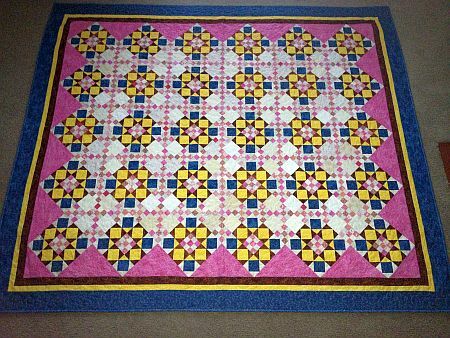 I made the king size and I believe the finished size is about 104" square. I laid it on my California king bed and it overlaps - thank goodness!!! My #12 is a small stitchery created by Joann Mullaly, formerly of the Country Loft, who does a lot of primitive work. Joann's blog is: woolcrazy-jam.blogspot.com. 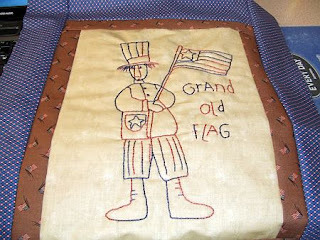 The stitchery is great for July 4th and I am so happy that it was chosen prior to July 4. 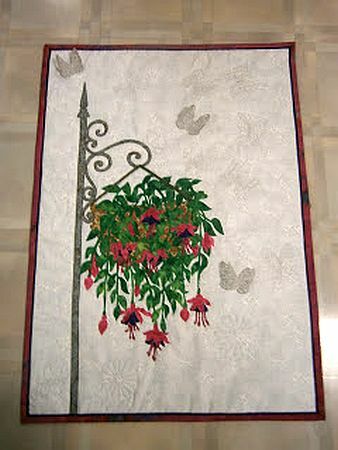 The threads are a variegated Valdani and the stitchery was done on a tea-dyed muslin. The total size is approximately 16 x 24. 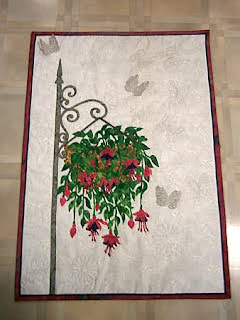 Knautical is a Judy Laquidara pattern from last year that was a quilt along. Judy doesn't have it listed in her Free Patterns, but with a little hopping around on her website (www.patchworktimes.com) one could find it. Judy calls it Scraps Ahoy...."get my project being called Knautical?" What a great scrappy quilt, Sandi! Guess I'll add it to my Scrap Basket Sunday "to do" list! 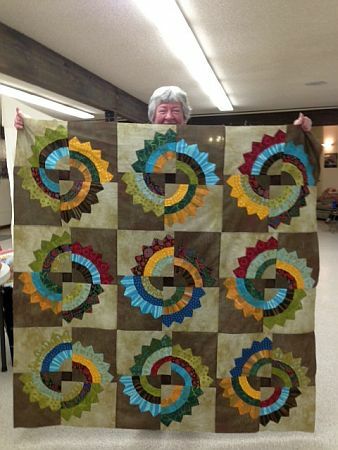 In spite of moving from Arizona to Idaho for the summer, finishing her "row by row" QAL and attending Quilt Camp in the Pines, Carol managed a finish in May! Carol says she is caught up now! Good for you, Carol! 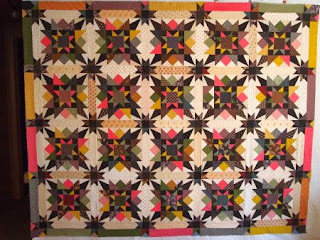 You've already seen the pattern for Martha's second May finish, on last Saturday's Road Trip Report. Here is why I had to add this pattern to my overflowing "I want to make this" list! 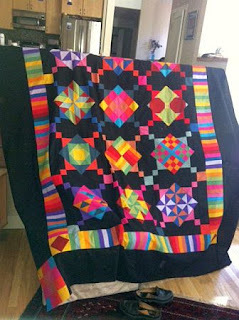 To really appreciate Sue's May UFO finish, you must go to her blog, here, to see the detail of the quilting. 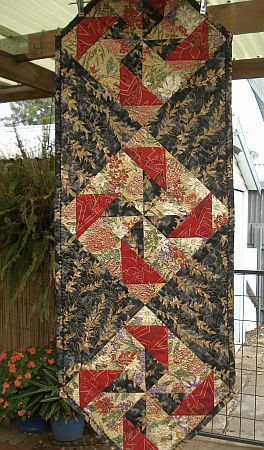 I love your loops-and-leaves quilting design, Sue! Click on the photo so you can see the 3D lacey butterflies -- and the beads! 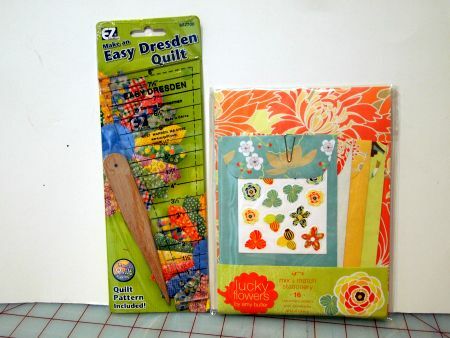 and the lovely free-motion quilting! 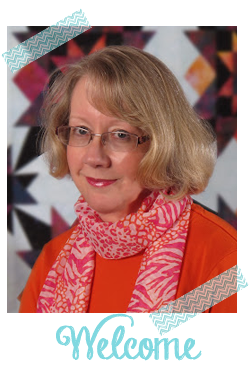 Here is the link to Susan's blog so you can read all about it! Deb S. finished this lovely, summery quilt -- she calls it "Watercolor Spring." 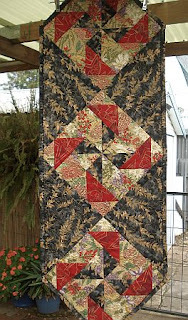 Deb reports "Strait of Georgia from "More Fat Quarter Quilts" by M'Liss Rae Hawley and it was inspired by a fat quarter bundle I bought from Keepsake Quilting in 2004. " Read about her quilt on her blog "A Simple Life Quilts," here. Oh wow, look at this beauty by Karen! You may recognize this as Bonnie Hunter's 2009 mystery quilt, Double Delight. Karen blogged her finish here. I think anyone who finishes one of Bonnie's mysteries should get extra credit! Eleven finishes for May (I can count mine, twelve!). That's pretty good! I found this cute Amy Butler stationery set online, and just in case our May UFO giveaway winner likes Martha's "Spin Cycle" quilt, I'm including a new EZ Dresden ruler. Oh, look, that's Carol! 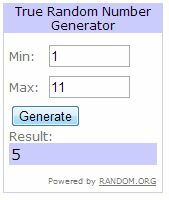 Congratulations, Carol! Tomorrow is "Scrap Basket Sunday" -- come back and see! So much eye candy - in particular I love Amish with a twist, and Sandi's Scrappy one and Karen's Double Delight..
Congratulations Carol! Wow! There are so many beautiful finishes this month! Wonderful UFO finishes this month... way to go everyone! What a great group of finishes this month. I'm sure we're all getting more done each month as we go along! Congrats to Carol too! The projects are beautiful! I love seeing all the finishes and the works in progress!